Kementerian Agraria dan Tata Ruang / Badan Pertanahan Nasional Republik Indonesia - Kementerian ATR/BPN or most commonly known as "BPN" is the Ministry of Agrarian and Spatial Planning / National Land Agency of the Republic of Indonesia. Kementerian ATR/BPN is the Indonesian ministrial agency which oversees the land and spatial planning affairs. Kementerian ATR/BPN has main task to carry out government duties in the area of ​​land in national, regional and sectoral. According to BPN's profile as cited by JobsCDC.com, Kementerian ATR/BPN is based in Jakarta and now supported by 474 land offices in 33 regional offices spread all over Indonesia. 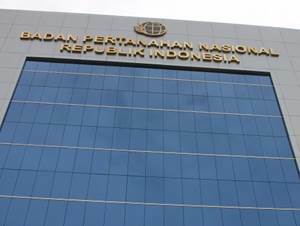 BPN's head office is registered at Jl Sisingamangaraja No 2, Kebayoran Baru Jakarta 12110. Since 2016, Sofyan A Djalil was appointed by the President Joko "Jokowi" Widodo as the Minister of Agrarian and Spatial Planning and the Head of National Land Agency to replace Ferry Mursyidan Baldan. Maximum age of 35 years old on 1 January 2016. Minimum graduate with Bachelor of Geodesy Engineering / Geography. The candidate with prior experience in the field of mapping/cartography is preferred. Expertise with CAD and Arc GIS. Minimum graduate with Senior high School (SMA) or equivalent. Minimum 3 years of experience in the field of mapping/cartography. Operating knowledge of CAD and Arc GIS. Minimum age of 18 years old on 1 December 2016. Alamat Jl Kuningan Barat I No 1 Jakarta 12710. Curriculum Vitae (CV) and working reference. Latest color photograph 4x6 with red background (4 sheets, please write your name in back side of he photogaph). Note : All docoments above must be submitted in stopmap (Green for Analis Kualitas Bidang Tanah Terdaftar and Yellow for Operator Komputer) and please mark your name on the front side of your application stopmap. JobsCDC.com now available on android device. Download now on Google Play here. Please be aware of recruitment fraud. The entire stage of this selection process is free of charge. Badan Pertanahan Nasional - SMA, S1 Fresh Graduate Analyst, Operator PTT BPN December 2016 will never ask for fees or upfront payments for any purposes during the recruitment process such as transportation and accommodation.